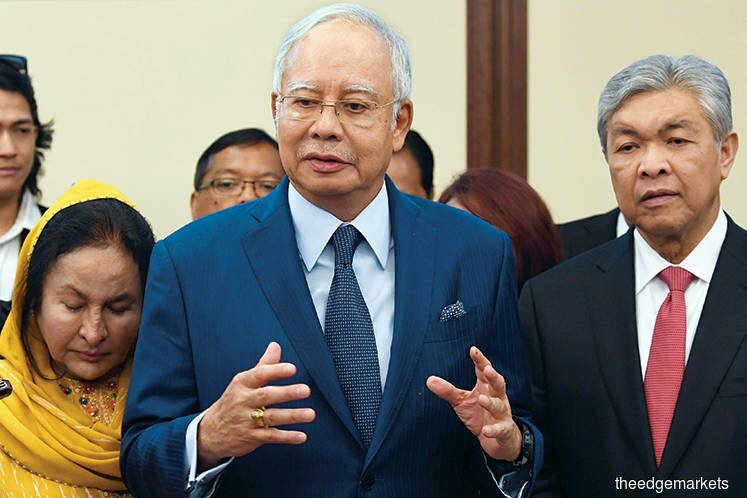 High Court Judge Mohd Nazlan Mohd Ghazali made the ruling after allowing the application by the prosecution led by Attorney-General Tommy Thomas to give a discharge not amounting to an acquittal to 66-year-old Najib. All the offences were allegedly committed at AmIslamic Bank Berhad, Ambank Group Building, No. 55, Jalan Raja Chulan on July 8, 2014 under Section 4 (1) (a) of the 2001 Anti-Money Laundering and Anti-Terrorism Financing Act, which provides for a maximum fine of RM5 million or imprisonment not exceeding five years or both, upon conviction. Earlier, Thomas told the court that the prosecution proposed not to proceed on three charges against Najib before the High Court and will seek an order of discharge not amounting to an acquittal. The money laundering case is originated from the Sessions Court and the prosecution should have mentioned the case before the Sessions Court before transfering it to the High Court. “This is not 'kedai nasi kandar' where you can just add on rice. The hearing will begin next Tuesday. What will the prosecution do? The three new cases have nothing to do with the old cases (SRC International). The money and the banking account were different,” he said. Mohd Nazlan in his decision said the court was of the view that the Public Prosecutor was similarly empowered to affect the withdrawal of the Section 418A of the CPC certificate, bearing in mind that there was no judicial determination that this section was unconstitutional by reason of Semenyih Jaya and Indira Ghandi cases. Muhammad Shafee, however, said he would file an appeal against yesterday’s decision saying that it was a serious matter that needs to be taken up to the apex court.